My eighth grade English teacher had our class write autobiographies based on our imagined lives as adults. In mine I recounted my exciting careers as a TV comedy writer, actor, and U.S. Senator. 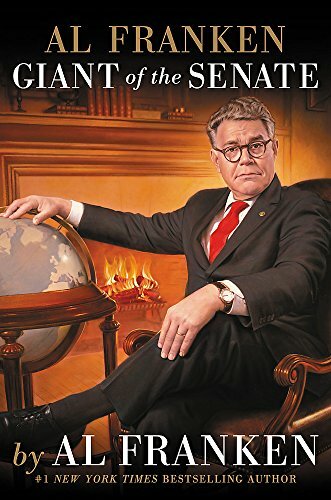 Well, Al Franken has actually lived my fantasy life, so naturally I’ve always been pretty fascinated by him and was eager to read his new memoir, Al Franken, Giant of the Senate. He doesn’t disappoint. Told with his seemingly effortless trademark humor, Franken recounts his life including his lengthy career as a comedy writer, and explains how his civic-minded upbringing, and background as a political satirist, led him to make the remarkable transition from comedian to politician. Starting with a brief overview of his childhood in St. Louis Park, Minnesota, Franken relates how he was drawn to comedy at a young age, entertaining school chums in elementary school, and then, after meeting his longtime friend and partner, Tom Davis, began writing and performing comedy together. Franken tells how he and Davis, after performing at the Comedy Store in Los Angeles, landed an agent at William Morris, and only a few months later were hired by Lorne Michaels to work on a new sketch comedy show, Saturday Night Live—a remarkable ascent by any standards. There are a few fascinating chapters about his days at SNL, and one can only hope that in the years to come Franken will write a book, or even a couple books, devoted just to that time period. But this memoir is largely about his transition from comedy writer to U.S. Senator—and what an interesting journey that has been. Franken gives much credit to Paul Wellstone, former U.S. Senator from Minnesota, for inspiring him to enter politics, in part because of their shared values, but also because Franken felt compelled to take on and beat Norm Coleman, the Republican Senator from Minnesota who besmirched Wellstone’s legacy shortly after Wellstone’s tragic death. Wellstone’s influence is a recurring theme throughout this memoir, and seems to be a constant reminder to Franken to do the best job possible representing his home state. For anyone even mildly interested in politics, the chapters about Franken’s political campaign should be fascinating, especially how his celebrity background, while at times a benefit, was used against him by his opponent, by lifting jokes from his satiric comedy writing and presenting them as out-of-context personal statements. Franken quickly learned that he had to distance himself from his comedy career, and refrain from making jokes on the campaign trail. Even today, as Franken relates in a later chapter, he must self-censor, resisting the urge to crack wise on the Senate floor. A topic I found particularly interesting was when Franken writes about making friends with his political opponents, which is really a necessity, he reveals, because co-sponsoring bills with politicians from the opposing party betters the chance of success. While Franken’s friendships with GOP senators might start out of necessity, some have developed into more meaningful friendships, certainly providing hope for the rest of us in these divided times. Which brings me to the nervewracking chapters in which Franken describes being witness to the early days of Obama’s presidency, when Mitch McConnell and the GOP’s employed a tactic of delaying and fighting all legislation, whether they agreed with it or not, in an attempt to sabotage Obama’s success. Reading these passages is tense. Franken, almost as if he sensed the anger his words might inspire, quickly segued from this topics to a stress-relieving funny story about George Bush, who has become an almost teddy-bear like political figure by modern comparison. Though Giant of the Senate is certainly entertaining and enlightening, the timing of the book release was unfortunate. Had it been a year earlier, it would have been a funny and fascinating read about what it’s like behind-the-scenes in DC, as in, “Those darn politicians!” But with our current political climate, some things just don’t feel funny right now. I never realized my eighth grade career dreams, but after reading Al Franken, Giant of the Senate, and learning about what politicians have to endure both to get elected and to actually get anything accomplished in Washington, the idea of going into politics, seems less attractive to me now. But it’s certainly reassuring that there are politicians like Senator Franken, who are willing to make this personal sacrifice; willing to learn the ropes and play the game, because they genuinely care about improving the lives of their fellow Americans.